I have some issues with making MT to work with OpenVPN server (Debian). I can make successfull connection to OVPN server, but traffic is not routed through OVPN server. Here is my configuration. This is all my config on OpenVPN Server (Debian/Linux). 0    chain=srcnat action=masquerade to-addresses=0.0.0.0 out-interface=ether1 log=no log-prefix=""
As you can see, I can ping OpenVPN server from Mikrotik. But when I use internet from Local PC it shows 81.190.190.100 IP address, not the one I would like to see - OpenVPN servers IP - 95.2.171.3. I can successfully ping/traceroute to 10.8.0.1 from Laptop (192.168.81.100/24), but cannot understand why it's not routed through VPN tunnel. I think I'm missing something with routing either on server (Linux) or client (mikrotik). 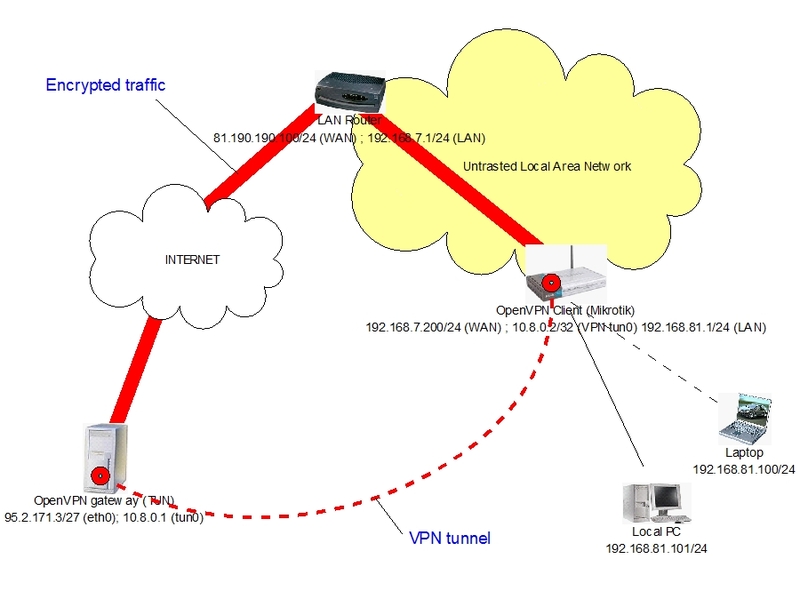 Your client is not routing through OVPN tunnel because there is no route(default gateway) on mikrotik! Also there should be a nat rule for client(src-addresses 192.168.81.0/24) on it. Not the answer you're looking for? Browse other questions tagged linux vpn routing openvpn mikrotik or ask your own question.